It is not to late to get something for Christmas! What opening are you playing? Are 3 wins the same as 2 wins and 3 draws? Picking a ChessExpress player of the year for 2010 has been a little tougher than previous years, as the leading Australian players all seemed to have good years, without anyone having an outstanding year. An example of this was the 2010 Olympiad where the Open team played pretty much to their rating level. However earlier in the year there was one significant performance for Australian chess and that was IM George Xie scoring his third GM norm at the O2C Doeberl Cup. He went through the event undefeated and scored wins over GM's Bojkov and Zhao. He continued to play good chess throughout the rest of the year, winning several weekenders and finishing in second place in the Yulgilbar-Think Big Australian Grand Prix. Therefore George Xie is the (ChessExpress) 2010 Australian Player of the Year, and hopefully next year will see him pick up enough rating points to confirm his GM title. The 2010 Gold Coast International had an exciting final round, with a number of players in a position to win the event. However id was FM Junta Ikeda who finished outright first after defeating Sally Yu, and seeing a couple of other results go his way. With the tournament using the 3-1-0 scoring system, Ikeda's 7 wins,1 draw and one loss was enough to finish ahead of Moulthun Ly (6 wins, 3 draws) and GM Zong Yuan Zhao (7 wins, 2 losses). While the event did not have enough overseas players to qualify as a norm event, it did provide the opportunity for some players to pick up important rating points. Ly (who already has 3 IM norms) should move towards th 2400 mark he needs for the title, while Ikeda recovers some of the points he dropped at the Australian Junior Masters earlier this year. The top two seeds (Zhao and Xie), might be dropping points, but at least they played what looks like the game of the tournament. The final round clash saw Xie choose an interesting idea in the French (10. ... g5) although the game was still theory up until move 15. 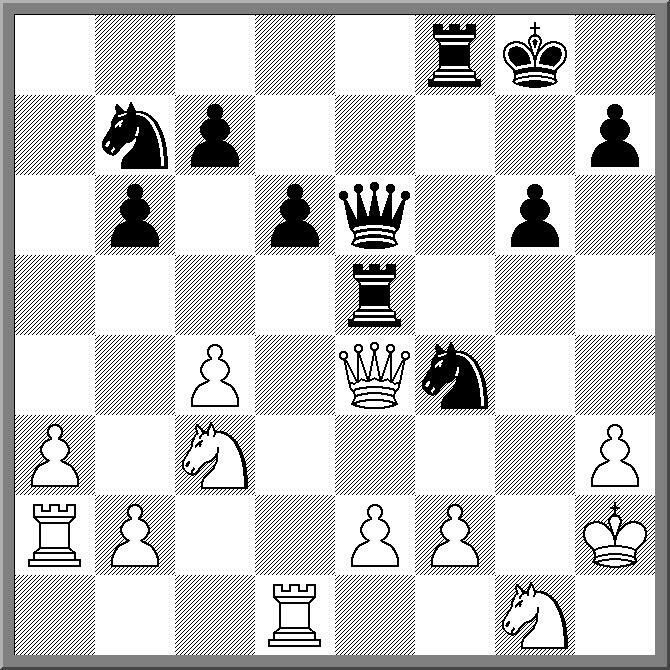 Zhao then played a new move (16.Rf4 rather than 16.c3) and a few moves later sacrificed a piece for an attack on the king. Xie wasn't able to protect h7 and with mate beckoning, resigned. One event that has stuck solidly to its traditional dates is the Hastings Chess Congress. Of course some things have changed over the years, with the Premier event being a swiss event rather than Round-Robin, involving a mixture of English players and various visiting GM's. About to head out for a day or two to the middle of New South Wales for a bit of RR. While net connection may be a little shaky, I'll hopefully make up for it by finding a few second hand bookshops to raid. Of course chess books are often a scarcity in those parts, but with crossed fingers I might strike it lucky. Within the last 3 weeks I was asked whether I would be able to be an arbiter at 3 different tournaments. Two of those requests were as last minute fill-ins, while the other was further down the track. Unfortunately I had to say no to each request, as they clashed with prior commitments (which was a shame as I would have liked to do at least 2 of them). The requests came from a couple of fellow (senior) arbiters, and during the discussion we agreed that there is a pretty small pool of arbiters in Australia to call upon. This partly explains why the same faces keep popping up at the 'big' events, although organiser preferences also play a part. While there may be a few reasons why there aren't more arbiters in Australia, I would like to focus on one reason. I believe the lack of arbiter accreditation in Australia has a lot to do with the problem. Without accreditation there is no impetus for arbiter training, and there is no way that organisers know who is qualified to run their tournaments (apart from word of mouth). More importantly, the lack of accreditation also leads to a situation where potential arbiters are left behind/ overlooked as they themselves don't have a yard stick to measure themselves against. There may be a number of people who could do a good job of being an arbiter, they just don't realise it. Of course the sensible solution is to have an arbiter training and certification program, as many other countries have, but movement in this area has been somewhat glacial. For the moment the training seems to be left with local clubs, with a belief that arbiters will just bubble up to the higher levels. From my experience this hasn't really happened, and therefore a new approach is what is required. There was a time when the post Christmas period was either for playing in the Australian Open/ Championship or not playing chess at all. Then a decline in numbers for these events made potential organisers think that no one really wanted to play chess in the period between Christmas and New Year, and for the last few years the Australian Open/ Championship has started in the New Year (usually the 2nd). However other organisers decided that people did want to play in the period between Christmas and New Year (even if they didn't want to play in the Australian Champs/Open), and began to slot events into that period. One event that is taking advantage of this gap is the Gold Coast International. This event has attracted a field of 55 players, with a couple of strong players at the top (GM Zong Yuan Zhao, IM George Xie), a group of up and coming junior players (Ly, Ikeda, Morris, Brown and Nakauchi), and a then a field consisting mainly of Queensland players. The event started today, with the first two rounds being completed. Results have gone mostly to seedings, although a couple of players in the top 10 were held to second round draws. One nice feature of this event is the live coverage of the top 10 boards, (using the Monroi devices), meaning I can divide my time between chess and the cricket (shudder!). Here is a game from round 2 where 4th seed FM Junta Ikeda demolishes his opponent after an unwise two pieces for rook and pawn exchange. While we are all recovering from what was hopefully an enjoyable Christmas Day, the chess world moves on. Yesterday saw Hou Yifan become Womens World Champion, while tomorrow sees the Gold Coast Chess Festival kick off. up this game played a few years ago. While it involved a couple of 2500+ players, I wonder if Black had too much of the Christmas spirit, as he seemed to gift White a fairly straight forward attack. Although Christmas is only 30 minutes away (AEST) you still have time to get that very last minute gift. With the advent of online software purchase and delivery ( *cough* steam *cough*) it has become substantially easier to round out your shopping with that cheap and almost useless gift. Of course this depends on your intended recipient being heavily into computer games, so I would recommend it for the younger members of the family. One potential purchase in the area is Chessmaster X, which now appears to be renamed as Chessmaster Challenge (I assume they are the same program based on the screenshots). I had picked up a copy of this for around $20 a few years back, but it seems to no longer be in stock, as I haven't seen a copy for 18 months or so. However while checking the online store at Steam, I spotted it retailing for $2.49 US (which is about $2.49 Aus these days). Of course you might chew up a little band with downloading it, but even now I know of some ISP's who don't even charge for this. Courtesy of Stewart Reuben comes the following puzzle. 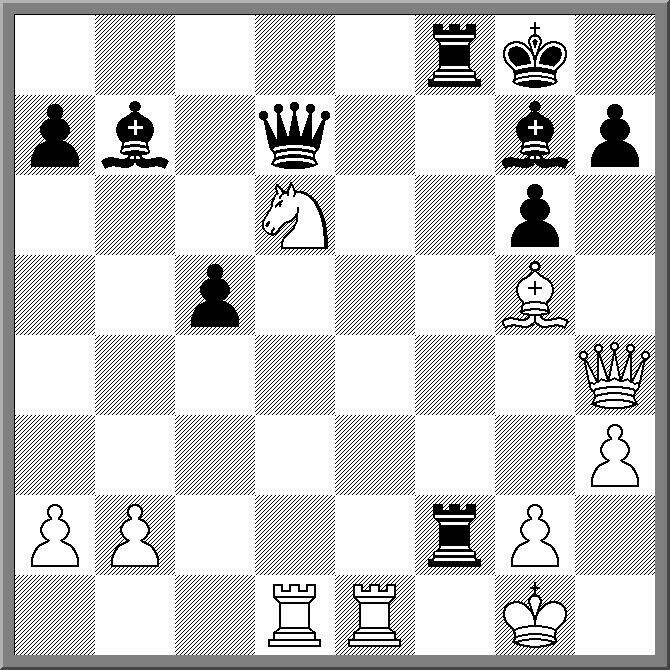 According to the FIDE Laws of Chess, what was the last move in this game? Now as it is a puzzle for abiters, and an arbiter should always have the rule book handy, I'll point you in the right direction. 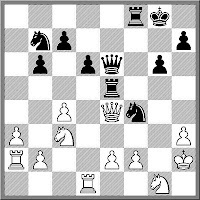 Rule 9.6 of the current Laws of Chess is your friend. Just about every blog I read seems to be running some sort of Xmas quiz. Annoyingly, at least for those who are loyal members of the Free Internet Chess Server, the prizes on offer are yearly memberships of another, very naughty, chess server. Now while this blog does not do quizzes of this sort, I actually do a quiz every year in the magazine Australasian Chess. 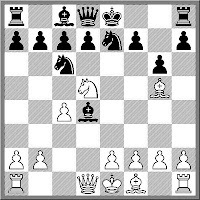 It is always 10 chess problems of varying degrees of interest, difficulty and evil. There are prizes on offer for the players with the best score (normally GM David Smerdon btw) which are provided by Australian Chess Enterprises. Another addition to the collection of cheapo draws that the peacefully inclined player should know. This is from the current Russian Championship and ended, like all good cheapo draws do, in a draw by repetition. 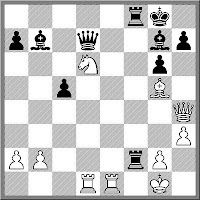 Once White takes on c6 with the queen, the repetition is forced, and both players had the rest off the day off. Obviously different cultures have a differing approach to Christmas, and this even spills over to the chess world. In the past the Asian Club Cup has run over the Christmas period, and this year there are a couple of events that run pretty close. In Queensland the 2010 Gold Coast Chess Festival starts on the 26th of December. While this avoids Christmas day itself, those travelling from interstate may need a Christmas afternoon departure to make it in time for the first round. Even trickier is the schedule for the Singapore Open/Asean Championship. It also begins on the 26th of December, but there is a players meeting scheduled for the afternoon of the 25th. So in this case you have to spend your Christmas Day at a chess tournament, not playing chess! Via William Edward Winter (Chessnotes) and John Saunders comes a link to a treasure trove of historical chess film. While the collection is centered around former world champion Max Euwe, also featured are former world champions Capablanca, Alekhine and Botvinnik. There are interviews and tournament footage, and while the page is in Dutch, it is pretty easy to identify which clips show which players. The link to the films is here. Note: You may be required to configure your inline video player before viewing the first film. Starting with last years event, the ACTCA Rapidplay Championship has been held outdoors in the middle of Canberra's main shopping district. Of course in choosing such a venue, the effect of inclement weather has to be taken into account, and so it turned out for this year. Despite a forecast for clear skies (on Thursday) by this morning this had changed to 'isolated showers'. Still there was hope that the rain would hold off and allow the tournament to run smoothly. In fact it held off for all of 2 minutes into the first round, when suddenly the downpour started. Fortunately we had a backup plan, which was to grab sets, boards, clocks and everything else, and sprint indoors to King O'Malley's. Resetting the tournament only took a further 10 minutes, and we were underway with only minimal delay. After the initial excitement, the tournament became a procession for FM Junta Ikeda after the half way mark. By the end of 7 rounds he had scored 7/7, finishing 1.5 points ahead of second placed Yi Yuan. Back in third place were FM Endre Ambrus, Allen Setiabudi and Miles Patterson. So said the late Rodney Dangerfield. Such a comment may also apply to the Russian Championship, which seems to slip under the radar in terms of Super GM events each year. This can possibly be explained by the fact that not 'every' top Russian player is playing, but this only seems to reduce the strength marginally. This years event has Svidler, Grischuk, Karjakin etc taking part, and with 6 rounds already played, Svidler leads with 4.5. Karjakin is in second on 4 while Grischuk and Nepomnichtchi are tied for third on 3.5. The 6th round saw Svidler move into the outright lead with a nicely played win over Malakhov. After the debate and consternation concerning the scoring system for London 2010 Carlsen did what was needed to win the tournament, by beating Short in the final round. With Anand and McShane only drawing, Carlsen finished a full 2 points in front, under the 3-1-0 scoring system used in the event. Of course under the classical system all three would have tied on 4.5/7, but under the 'most wins' tie-break systems (which is used in some round robins) Carlsen would have still been the winner (although the 3 players may have split the prize money evenly). Apart from the debate over placings, there were a number of interesting things in this event. McShane was the 'hero' of the event, finishing undefeated, and beating Carlsen in the first round. Of course Anand did likewise, but more is often expected of him. However his win over Carlsen will keep the 'World Champion v World No 1" argument bubbling along. (Note: He was my tip to win the event, although I didn't put this tip up on this blog). Kramnik and Nakamura tied for 4th although Nakamura gains a few rating points while Kramnik drops a few. Of course if Kramnik had iced Carlsen in round 6 then this whole post might have been different. Of the remaining three English players Adam's would be the happiest, at least scoring 50% while Howell and Short were a long way back. I once read a story from an Olympiad years ago, concerning a game between two women players on the lower boards. White started off by playing an opening that was familiar to her, but after 5 or 6 moves she decided something wasn't right. While her pieces seemed to be on the right squares, her opponents did not. So leaning across the board she said "Excuse me, I'm playing the Giuoco Piano, what opening are you playing?" Now I'm not sure how true this story is, but I was reminded of it when I saw the following game from the current Womens World Championship. Against the Sicilian Defence Kovanova decides that the Giuoco Piano is a perfectly fine choice, and crushes her opponent in 25 moves. After 5 rounds of the 2010 London Chess Classic, 3 players share the lead. Anand and McShane have 2 wins, and 3 draws, while Carlsen has 3 wins and 2 losses. Of course the fact that they share the lead is a result of the 3-1-0 scoring system, which has provoked a degree of discussion in the chess world. While this may seem to be a new debate, in a sense it is a topic that has been around for quite a while. Not in the direct sense of how many points should a win be worth compared to 2 draws, but in the indirect sense of what is a win worth when discussed in connection with tie-break systems. In the Sonnenborn-Berger system the tie-break score is sum of the scores of the opponents you beat plus half the scores of the players you draw with. What of course is missing from this total is the scores of the players you lose to. It turns out that you get a better tie-break by losing to weaker players and beating stronger ones, meaning that losing to strong players has a bigger impact than beating weak ones. This has never seemed quite right to me, but I've never seen a way of fixing it up (if S-B does need fixing at all). Of course 1-0.5-0 or 3-1-0 aren't the only way to score results. One suggestion is a 5-2-0 system, which if used in London would have Anand and McShane a point in front of Carlsen (which some people think is fair). However if you look at such proposals properly you will soon discover that scoring systems using 2n+1 - n - 0 points are the same as 1-0.5-0 if n becomes large enough. So if you travel down this road you may as well not travel at all. The traditional end of year Canberra chess event, the ACT Rapidplay Championship, is on again this coming Saturday. Last years event was very popular (42 players) with Junta Ikeda narrowly beating out GM David Smerdon for the title. For those who haven't played this before the venue is outdoors in City Walk (opposite Chicken Gourmet/ King O'Malley's) and if the weather is fine, it makes a glorious setting for a chess tournament. I've done it on a couple of occasions (including a horrible loss in the 2000 Olympiad) so I do sympathise with Nigel Short after his 4th round game against Viswanathan Anand in the London Chess Classic. He had a good position for most of the game, but on move 35 he started his quest for the brilliancy prize, starting a sequence that involved a piece sacrifice. This gave him 2 mating ideas (Qh5 and Qe7) but Anand killed them both with 38. ... Qd6. Down a piece Short was then mated 5 moves later. * The source of the expression "to blow a sandshoe" is this accident here. At some point in the past I had a small collection of chess tournament posters. It is quite possible I still have this collection, but given the dis-organised state of my chess library, it may be difficult to find. The posters were mainly from Australian chess events of the late 80's/ early 90's, including the Mercantile Mutual Masters events, and a number of Cepacol tournaments. Wondering whether there was a central repository for such items on the internet (digital images rather than the real things) I did a quick google search. In a sense the central repository is the internet itself, as a number of links popped up, although some were for commercial outfits. This link is probably the best source, as it is the google link to a it's own collection of images. I've looked at the front page and they all look SFW (Safe for Work), so if you are interested in looking at chess posters from around the world (and are willing to ignore the cruft) this is a good place to start. Round robin title norm tournaments have become a rarity these days, with most organisers finding that large swisses are a more cost effective format. A few months ago I mentioned that New Zealand were at least keeping the format alive with the George Trundle Masters, and I'm pleased to say that the Chess Victoria are doing the same in Australia with the 2010 Australasian Masters. This 10 player round robin is currently being held at the Box Hill Chess Club and the organisers have cleverly assembled an international field by utilising some Australian based overseas registered players, as well as getting Michael Steadman over from New Zealand. So far 7 rounds have been held and IM Stephen Solomon is the pace setter with an impressive 6/7. A point back are Bobby Cheng and Erik Teichmann and with the IM norm requirement 6.5/9, these are the only 2 players with norm chances left. Details of the event are on the Chess Victoria website, while live coverage of some games is here. The 2010 London Chess Classic started last night (Canberra time) and already there is plenty to talk about. The big shock was Luke McShane's win over Magnus Carlsen, where it is pretty safe to say that Carlsen was simply outplayed. Kramnik began with a win over Nigel Short, while Anand and Nakamura played a long draw. Interestingly the Adams v Howell game started with the same opening as Anand v Nakamura, bur rather than a long draw, Adams launched a decisive attack. In the Womens Invitational Canberra WFM Shannon Oliver got of to the best possible start with a win over top seed Susan Lalic. And playing in the 160+ player Open is IM Aleks Wohl, although he was upset in the first round by a 2043 English opponent. Not really live, but vision from the tournament hall nonetheless. While live coverage of chess tournaments is mainly about relaying the moves via a web interface, there have been attempts at providing video coverage as well. For the moment this is often in the form of an end of round summary, interspersed with some live action shots. However I am sure there will come a time when video coverage of the games will begin to catch on (depending on cheap bandwith I guess). Here is a taste of where this is heading (minus the shaky camera work). It is from the ChessKids national Championship and features Karl Zelesco (L) against Michael Kethro (R). 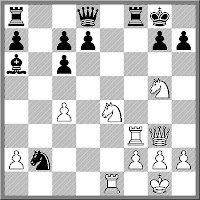 There are more videos from Chesskids evets here (including the completion of this game). Sifting through a number of games played last month, I cam across the following clash from the World Blitz Championship. I suspect Karjakin was playing the first few moves on auto-pilot and walked into quite an old trap. While the initial game was played in 1928 I'm pretty sure I've seen it in a number of guises (including a Reinfeld simul game). The London Chess Classic starts in a couple of days. The drawing of lots will take place on the 7th with the tournament starting on the 8th. Once again it will be an very strong event, with an average strength of 2729. Repeating last years format the field consists of 4 English GM's and 4 very strong non-English GM's. This year sees Viswanathan Anand take part, and the mini round robin between Anand, Carlsen and Kramnik will probably the highlight of the tournament. Alongside the Classic are a number of other events, including a big open swiss, and an invitational womens event. Taking part on this event are Shannon Oliver (from Canberra) and Natasha Fairley from New Zealand. Full details of the tournaments including live coverage, can be found at the tournament home page. After last weeks ChessKids National Championships, Curtin Primary traveled across to Perth for the Australian Schools Teams Championship. joined by teams from Lyneham High, Kaleen Primary and Radford College. This two day event, organised by the Australian Junior Chess League, brought together the winning schools from each states schools competition (Hight School, Primary, High School Girls, Primary Girls). Of the Canberra schools, Curtin picked up Silver in the Girls Primary, Lyneham picked up Bronze Silver in the Girls High School, while Kaleen Primary and Radford College both finished 4th in their sections. I've been following the fall out from the decision to award the 2018 and 2022 World Cups to Russia and Qatar, and at this early stage it looks like a re-run of the post FIDE election coverage from 2 months ago. The reactions of the fans and media of the losing countries seem to be a mixture of disbelief and bitterness, with suggestions that the whole voting process was flawed. Coupled with accusations that FIFA is a 'corrupt' organisation, and it all looks very familiar to anyone who follows FIDE politics. However one interesting difference is that their are some arguing for an expanded voting pool, even going so far as to suggest one country one vote. This is a marked change from the media reaction to the FIDE election, where there were suggestions that only 'real' chess countries should vote, where 'real' was implicitly defined as either Western European, or simply Karpov supporting countries. This article from the BBC concerning the FIFA vote makes some good points (eg more voters means less scope for corruption), which those campaigning for a reduction in the FIDE voting pool should take note of. However, as long as people keep losing elections, they will look everywhere except at their own campaign to explain their defeats, and as long as they do, they will keep losing elections. Having failed to solve the problem mentioned in this post, the best I can do is throw up another puzzle (from the entertaining book "The Chicken from Minsk"). Two mathematicians, Igor and Pavel, met in the street. "How are you? How are your sons?" asks Igor. "You have three sons as I remember, don't you? But I have forgotten their ages". "Yes I do have three sons", replies Pavel. "The product of their ages is 36". Looking around and then pointing to a nearby house, Pavel says, "The sum of their ages is equal to the number of windows in the building over there." Igor thinks for a minute and then responds, "Listen, Pavel, I cannot find the ages of your sons." "Oh, I am very sorry," says Pavel; "I forgot to tell you that my eldest son has red hair." Now Igor is able to find the ages of the brothers. Can you? I had an interesting query about what defines a "promising" junior player. However it wasn't a query about temperament or skills but something more direct and quantifiable. The question was essentially about the relationship of rating to age, and whether this was a predictor of future success. The question sparked a memory of something I read in the very excellent "Play Better Chess" by Leonard Barden. Towrds the back of the book Barden had a table of BCF grades and player ages which indicated whether a player would reach 2200 by the age of 23. As I couldn't find it online anywhere I dug up my copy of the book. Here is an abridged version of the table (translated into ELO ratings), with the caveats that it was published in 1980, the translation of BCF to ELO ratings (using the BCF*8+600=FIDE formula) isn't always accurate, and ACF ratings may or may not be 200 points lower than their FIDE equivalents.